The Shock Trooper is an example of a typical visitor soldier -- and the backbone of their ground forces. Usually, visitor Shock Troops are deployed in squads of three or more, functioning as dismounted infantry units. The Shock Trooper wears a protective helmet of a strengthened plastic polymer, coated with a surface material that is impervious to all but large-caliber bullet hits. It has a reflective finish to inhibit the effectiveness of glancing laser strikes. The tinted visor is polarized and can be adjusted to varying degrees of translucence by the trooper. The visor protects the eyesight of a trooper in combat, as the "muzzleflash" of the energy weapon is devastating to the visitors' sensitive eyes. The visor thus enables the trooper to function effectively. 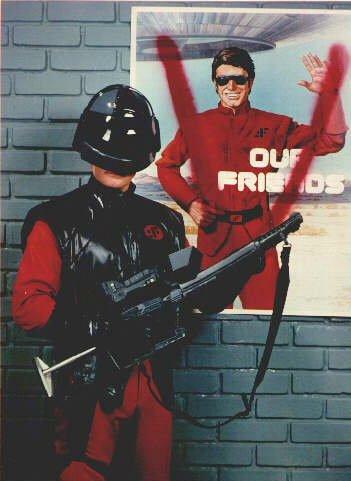 The shiny black leatherette-like breastplate worn by all Shock Troopers is a sort of "flak jacket" composed of closely-woven polymers and sytenium fiber. This lightweight "fabric" is impervious to all but Teflon-coated projectiles and is fireproof. Various types of Repair Skills for different individuals (i.e. Ground Crew, Computer Programmers, Weapons Repair Techs, etc). Skills in this section are between 4/5D. The visitor Technician wears the standard issue coverall seen on all male and female visitor personnel, with subtle variations, throughout their fleet. The coverall is a one-piece jumpsuit composed of a material similar to, but more resilient than terrestrial cotton fabric. The detachable "breastplate" features insulating material and padded shoulders. All markings on the coveralls, including rank and piping, is black, with the exception of that on some fleet functionaries' coveralls (security guards, security officers, etc., whose markings may appear in gold). The symbol of the "supreme leader" or the so-called "visitor logo" is worn on the right breastplate by enlisted men, on the left by their officers. Visitors of every rank wear boots composed of a vinyl material, with hard plastic soles and fasteners. The uniform most shown in the series is the West Coast/Fleet Standard rust color, but has been seen in white, black and light green, corresponding to fleet service units deployed in the Midwest and East Coast areas. The typical visitor uniform is topped by a black duty cap, similar in design to our own military caps.